Dr. Henry Howard Holmes, born Herman Webster Mudgett, was born in 1861 in Gilmanton, New Hampshire. Mudgett was born to a wealthy family and was considered to have above-average intelligence. He assumed the alias H.H. 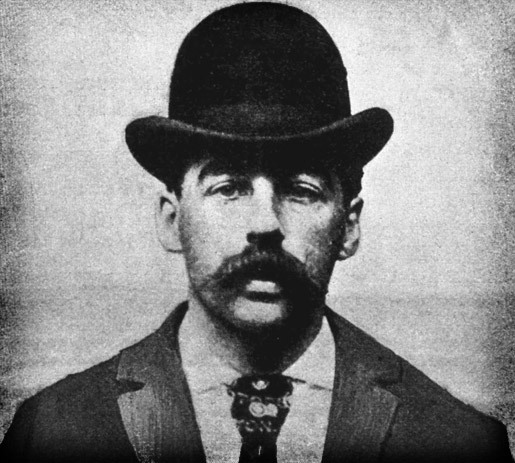 Holmes when he started his career as a con artist, committing numerous frauds and scams before becoming known as one of America’s first and most prolific serial killers. Holmes became a surgeon upon college graduation and it is believed that throughout his university career, he made a habit of stealing corpses and collecting on fabricated life insurance policies. He had practiced surgery on animals as a child, and it is believed that he also used the stolen bodies to perform deranged experiments. Holmes told so many lies, that many of his own accounts contradict themselves making it tough to discern truth from his world of deception and murder. In 1886, Holmes took over a drug store and had it renovated into a block-long, three-story boarding house, which would become his own personal playground of terror. He turned the building into “an elaborate maze of death traps,” according to Biography.com. 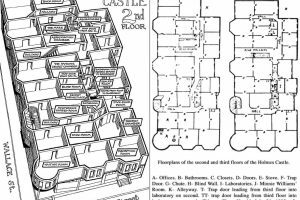 While the ground floor maintained the appearance of a drug store, the upper floors were converted into his own personal apartment, with an elaborate set of rooms designed specifically for torturing and killing. “It included stairs and hallways that led to nowhere, oddly angled hallways and rooms with no windows,” according to choosechicago.com. His disturbing dwelling included a gas chamber of sorts, used to, you guessed it, gas his victims. 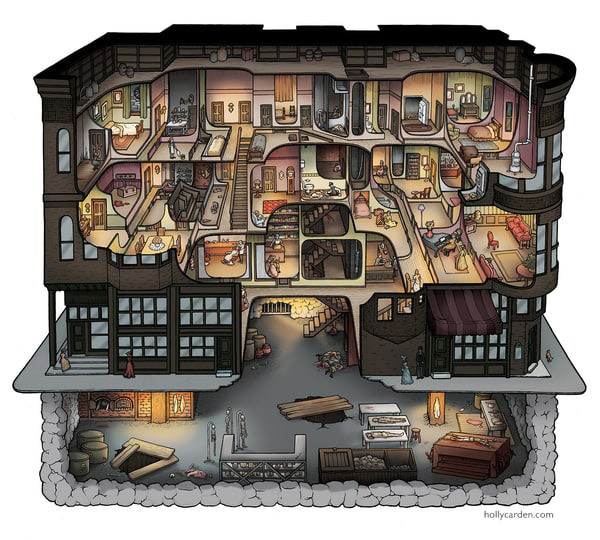 In the basement, an incinerator was used to dispose of the bodies, making it nearly impossible to determine just how many people he killed. Image courtesy of Holly Carden. 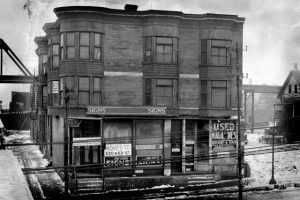 Over the years Holmes lured hundreds of unsuspecting women to his drug store with promises of love or money, then tortured and killed them. In 1893, Holmes generously invited visitors to the Chicago World’s Fair to lodge at his hotel during their stay. Unfortunately, many of those visitors never left. While he was committing these atrocities, Holmes was simultaneously continuing his insurance schemes. It was one of these schemes that led to his capture and eventual execution. A former business partner, Benjamin Pitezel, whom Holmes had promised a large sum of money, but never delivered, turned him into the authorities. During his trial for the insurance fraud case, he managed to commit at least five more murders; surreptitiously killing the backstabbing business partner and three of his children. H.H. Holmes mugshot. America’s first serial killer. Holmes was tried for the murder of his business partner Pitezel and was easily convicted. He appealed his murder conviction, but lost the case and was hanged in Philadelphia on May 7, 1896, just shy of his 36th birthday. 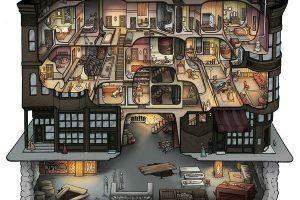 Investigators were able to confirm that 9 deaths occurred in the Murder Castle. Holmes himself confessed to the murders of 27, but there is ample evidence that he killed upwards of 200 people during his reign of terror. Where is the H.H. Holmes Murder Castle Today? 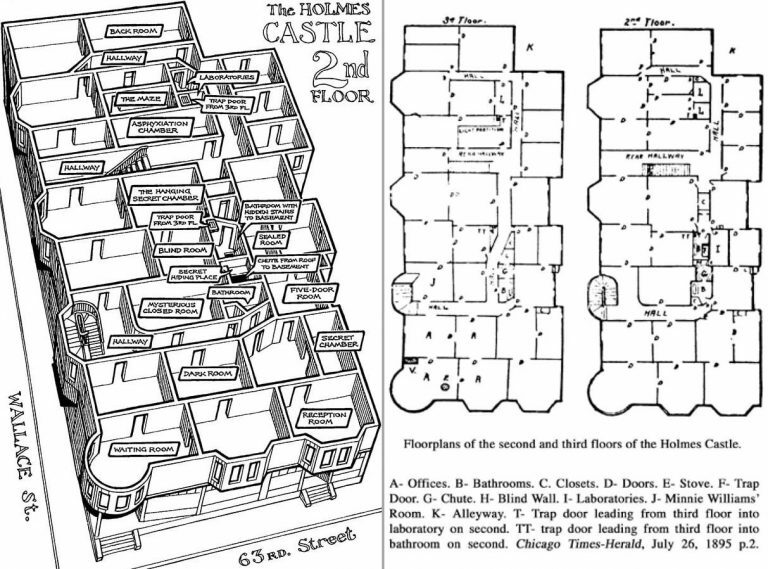 Weeks after the hanging, Holmes’ murder castle was set aflame by an arsonist. 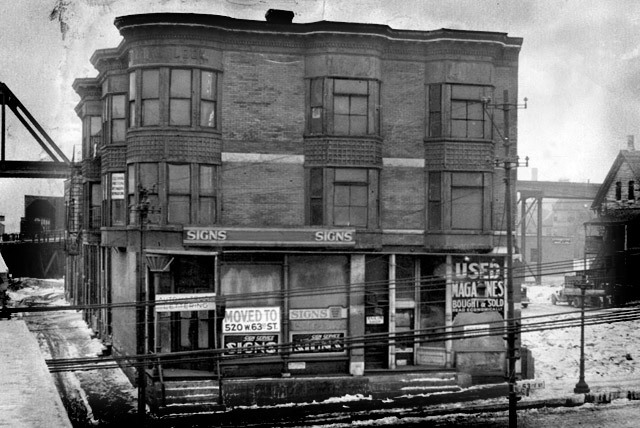 The building was nearly ruined but the first floor remained standing and was converted to a sign shop and a bookstore. 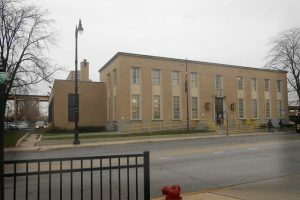 It wasn’t until 1938 that the site was truly given new life; a U.S. Post Office was constructed upon the abandoned locale. The H.H. 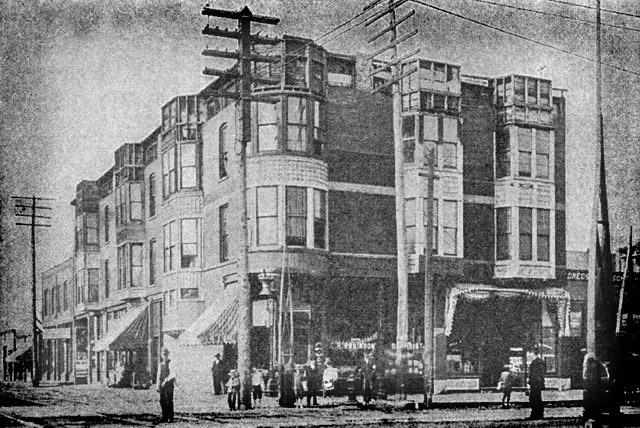 Holmes Murder Castle was torn down in 1938 and the Englewood Post Office now sits atop its remains. 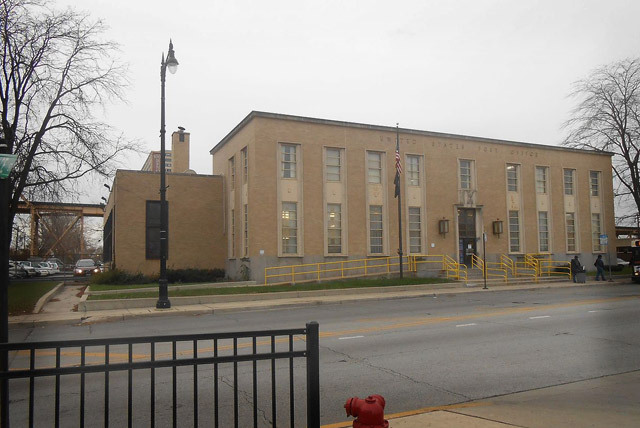 One postal employee shared her haunting experience; she entered a hallway while investigating a strange noise, only to find a hallway lined with folding chairs. She retreated to the lobby, and then upon returning to the hallway, found the line of chairs had mysteriously stacked itself. 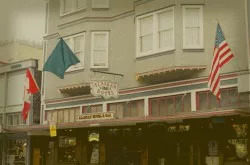 There have been several reports from post office employees of seeing a ghostly figure of a woman in the building, or outside in the courtyard where the murder castle once stood. 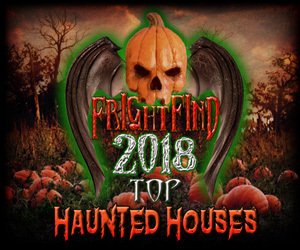 Visitors report hearing the haunting sound of a woman humming or singing in unoccupied areas of the building. In 2003, the story of H.H. Holmes was written into a best-selling novel by Erik Larson titled The Devil in the White City. The story intertwines true events of the 1893 World’s Fair in Chicago, the fair’s architect Daniel H. Burnham, and Dr. H. H. Holmes and his murder castle. Leonardo DiCaprio owns the book’s film rights and a big screen adaptation of The Devil in the White City is currently in the works. Leo is set to play the role of H.H. Holmes. 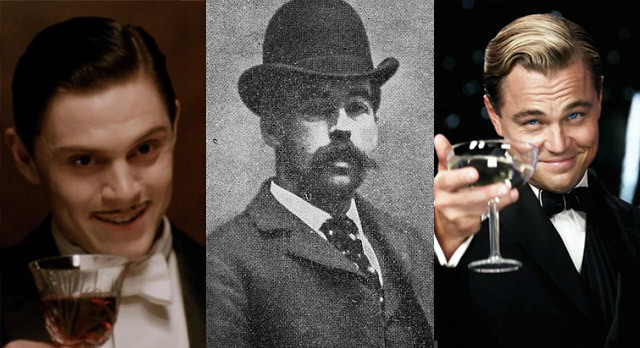 Evan Peters’ American Horror Story: Hotel character, James Patrick March, was also based on H.H. 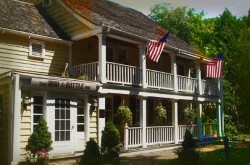 Holmes as was the hotel that the season was based off. 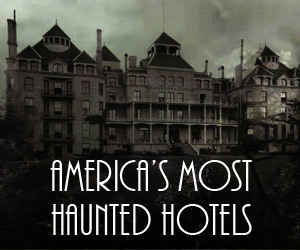 AHS: Hotel had other interesting true life inspirations such as the Cecil Hotel Amanda Lam missing persons incident. It’s getting all too real. 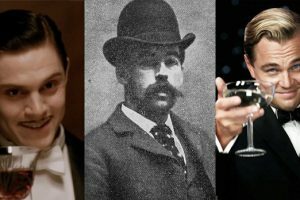 Did Holmes Escape His Own Death? Recent rumors have surfaced that Holmes may have escaped his execution. 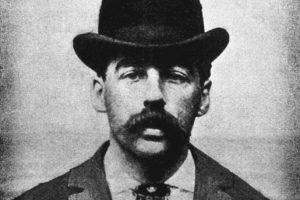 Locals believe that Holmes may have been able to bribe prison guards to help him escape. Holmes had requested his coffin to be encased in cement and buried 10 feet below the surface. Ironically, his reasoning was to avoid grave robbers who might use his corpse for experiments and dissection. One theory was that Holmes escaped to South America. A report in 1898 from the Chicago Daily Inter-Ocean claimed that Holmes was able to bribe his priest, lawyer and jailors to bury another inmates’ body in Holmes coffin. The report suggests that after the hanging, the undertaker’s carriage left the prison yard with Holmes still living body and that he then escaped to San Parinarimbo, Paraguay. However, that town doesn’t truly exist on the map. Did the H.H. Holmes escape his own death? We may never truly know. In 2017, Mudgett descendants petitioned to exhume the body of Holmes in an effort to identify if his body was indeed buried in his cement tomb. Anthropologists at the University of Pennsylvania are still conducting tests. The result of the exhumation confirmed that H.H. Holmes’ body was indeed in the tomb. More rumors abound that H.H. Holmes could have been “Jack the Ripper.” Jeff Mudgett, a Holmes descendant, found 2 diaries in which Holmes examines his participation in the murder of several prostitutes in London. The timing was right as Holmes may have been in London at the time and there were similarities in the brutality between “The Ripper” and Holmes murders. While the theory is interesting, the claims are loosely put together and there has yet to be any conclusive evidence and there may never be.